Metabolic Enhancement Training (or MET) is a proven training system designed to enhance muscle gain, boost your metabolism and mobility, and optimize fat loss. This 5-day program and downloadable video set gives you everything you need to start training with MET today! Thank you so much for the transformation and more importantly, for teaching me a different protocol of training to educate my clients with. The Abel MET approach stylistically was the most challenging training system I have ever attempted to perform and also a brutal transition from my everyday pace of resistance training. The core circuit complimented the high intensity training perfectly and enabled me the luxury of using very minimal amounts of standard cardio while getting in the best condition of my life. The ultimate metabolic enhancement training program, complete with comprehensive information and clarification from world-renowned coach and trainer, Scott Abel. The 5 day MET program is loaded with exercises and techniques for a total and extremely productive workout routine. Day 1 covers strength with a focus on the chest, quads, abs and core. Day 2 emphasizes the back and posterior chain. Day 3 you’ll learn about rotations and the best way to work deltoids. Day 4 focuses on legwork. Day 5 completes the sequence, working the arms, abs and core. Complete 5-Day MET written program with exercises, guidelines, rules, advice for substitutions and customizations, and more. To get real results in the gym requires focus and intensity. You have to know how to train. There is more to training than following a scheme of sets and reps. The only way to truly reach a higher level is to learn from someone who’s been there, in the trenches — Scott Abel has designed hundreds of programs for hundreds of clients. 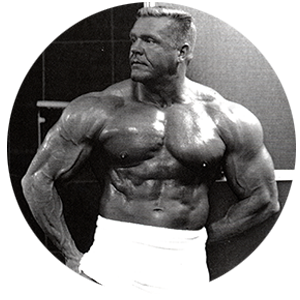 He’s worked with beginners and with pro-level bodybuilders and with everyone in-between. In these MET videos, you’ll have a chance to witness first-hand what true intensity and proper training really is. The 5-Day MET Training Program isn’t just a “list” of exercises. It’s a whole training methodology and a way of training that can take you to the next level in your physique. What is included in the 5-day MET training set? As soon as you complete your order, you’ll be emailed access to the complete 5-day training program and set of videos. The 5-Day MET training set also comes with a written program and a short write-up. Everything is downloadable, so you can be watching in minutes. Who is MET training for? MET is for you if you’re bored of your current training routine, or if you’re not getting the results you want from your current training. Whether you’re a beginner or a serious trainee, or whether you’re a personal trainer, MET will give you another tool in the toolbox to take your physique (or the physiques of your clients) to the next level. Will MET help me lose weight? We won’t lie: Scott doens’t believe in magic formulas. If your goal is fat-loss, then yes, you’re diet absolutely has to be in check. BUT as a complement to a proper diet, YES, MET is an excellent program for fat-loss because it is so intense. 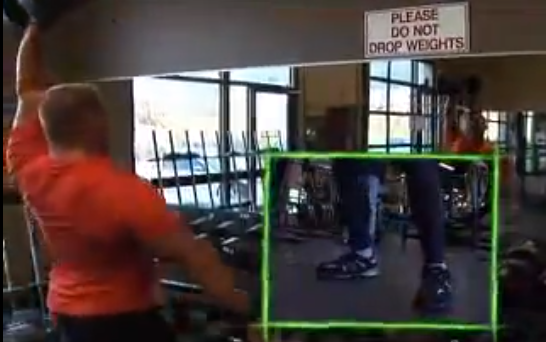 Metabolic enhancement training will help you preserve muscle and burn lots of calories. In fact, because of the intensity of the 5-day MET program, if you’re towards the end of a fat-loss diet, and you’re feeling a bit tired and rundown, then we wouldn’t recommend starting MET at that point, unless you also raised calories or started a spike day as well. Can circuits and metabolic movements really BUILD muscle? It is a myth in the fitness industry that a properly designed program with bi-plexes, tri-plexes, and other sorts of circuits won’t stimulate muscle growth. MET is excellent for building muscle, and it is simply “paradigm blindness” to believe that such tools are “only” useful for “conditioning” purposes. Again, when properly designed, these tools — and this 5-day program in particular — can also help you grow. Are the videos high definition? Nope, these ones are not. These are 480p, DVD quality. That’s not the same as 1080p. If that’s a deal-breaker for you, don’t buy this set. If you want one of the best metabolic conditioning programs on the market, this is still for you. The full written, 5-day program, with instructions, tips, substitutions, and rules of application. FIVE full-length videos, as Scott takes you through the whole program, day by day. 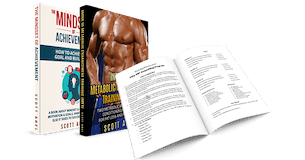 A bonus excerpt from Scott’s MET Workshop Ebook to give you more insight into the science and application of Metabolic Enhancement Training. MET is right for you if you’re willing to try new, incredibly effective bodybuilding movements that have powerful metabolic effects. 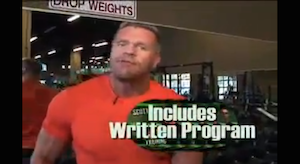 To be clear: if you want a very traditional bodybuilding program, then MET is not for you, you should stick with another program. If you want something new, that’s based on real research, proven, and tested on hundreds on Scott’s clients, then MET is what you want. Each of the videos are about 50 minutes long. They each cover one day of training, though not every set is shown, since that would get repetitive. Note that because Scott is constantly giving off-the-cuff advice and insight, these videos are dense. We recommend spacing them out, rather than watching them all in one go. 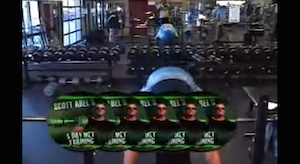 A good system is to watch each video before the corresponding workout, at least the first time you go through the program. This is because many of the movements might be new to you, and it’s good to know exactly how to perform each one when you walk into the gym, just to maintain the right “flow” or pace of the workout. We’ve also heard from clients that they’ll watch the videos a few times each, pen and notebook in hand. Make no mistake: MET is easy to learn, and anyone can do it, but there is a tonne valuable insight in the videos for the attentive trainee to pick up on. 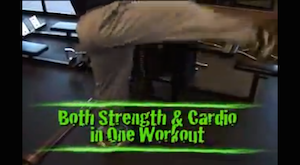 The program’s filled with functional, metabolic movements that would benefit someone after physique enhancement. The program is organised into bi-plexes, tri-plexes, and quad-plexes. There are also a few exercises not performed in a circuit. As a whole, and as you can see above, the program is a 5-day bodypart split, so you can get lots of quality volume without overtraining. Once you download the videos, the program, and so on, they’re yours… forever. You can put them an external hard drive, burn them to a DVD, wcopy them to your back-up computer, watch them on your iPad, whatever. They’re yours. End of story. Others might need a version that’s less metabolically demanding and has less volume. It’s a pretty demanding program, so the program itself not for your beginner clients, even though the principles of MET are certainly very applicable to beginners. This is rare, valuable information that can help you separate you from other “cookie-cutter” trainers out there. We’d love to go back in time and get them re-recorded, or to get better originals, but they were recorded for 480p, which is great for DVD players, but it’s not the same as 720p or 1080p. If that matters to you, then this product is not for you. That said, if you want the best information, and some of the best programming, this is probably it.